When you’ve spent hundreds or even thousands on your precious camera gear and equipment, you want it to be well protected wherever you choose to take it. There is always a compromise though, between the level of protection and mobility – hard cases are great for durability but they make for unwieldy carrying on a camping trip. In packing for the trip, I decided to take my essentials – a Digital SLR with walkabout 18-70 zoom attached, one lightweight telephoto zoom, and a flashgun. We had the luxury of power where we were staying, so I thought my laptop would come in handy as well for downloading and reviewing photos on the go. Along with all that, the necessary battery chargers, power packs, batteries and cables and my trusty PDA were included to boot. According to their website, Crumpler market the Sinking Barge as a “backpack for all day, day to day use that allows you to carry a 15″ laptop and accessories, as well as your compact photo and or video equipment and accessories”. It comes in three different colour schemes – black/mid grey/blue (being reviewed), dark brown/oatmeal/light orange, or a navy/blue/pale blue version. I actually think that the bag looks very stylish, with the distinctive crumpler logo tastefully emblazoned on the front, right shoulder strap and back, as well as mini versions on all the zippers. 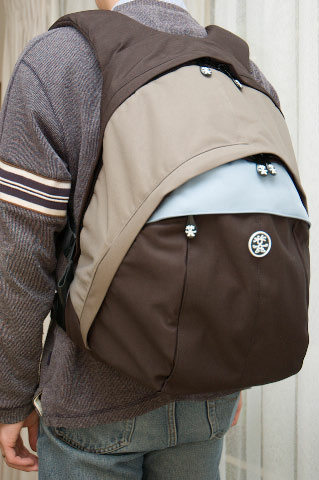 The look is very funky and modern and unlike the more serious traditional camera bags. The bag itself measures 36x49x26cm (14.2×19.3×10.2 inches), while the internal laptop sleeve accommodates units measuring up to 27x35x4cm (10.5×13.7×1.6 inches) in size. It is the smaller of two models: the Customary Barge model accommodates up to 17 inch laptops and larger camera kits. Let’s take a look at the internals. 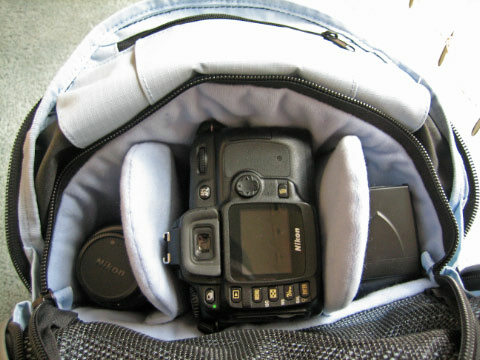 Backpack style camera bags are usually designed with a low profile, meaning that all the gear is stored flat within the main compartment. 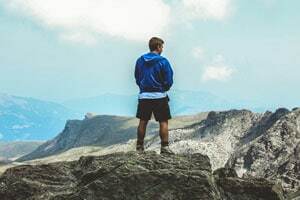 The disadvantage with this is that you need to take the backpack off and lay it flat when accessing the storage compartment, otherwise your gear will end up falling out. The Crumpler designers have opted instead to go with a more vertical camera bag type approach for photo storage – so if you think of a traditional camera bag stuck on to the back of a laptop bag, you are probably not far off. The Sinking Barge has 2 main storage areas – the top section being for a laptop, while the front section houses your camera gear. The front compartment of the bag opens up via 2 way zipper to reveal padded compartment with 2 adjustable dividers, giving essentially room for a DSLR with lens attached, and 2 additional lenses/accessories on each side. 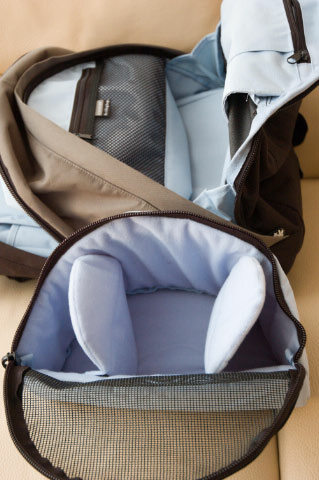 This compartment is covered by a zippered mesh to hold everything securely in place. It was a snug fit, but it was able to accommodate my Nikon D50 with 18-70 zoom lens, 55-200 zoom lens and SB-600 flashgun. I think if you had a bigger body or lenses, you would probably have to reconfigure the dividers to with some trade off in storage space. 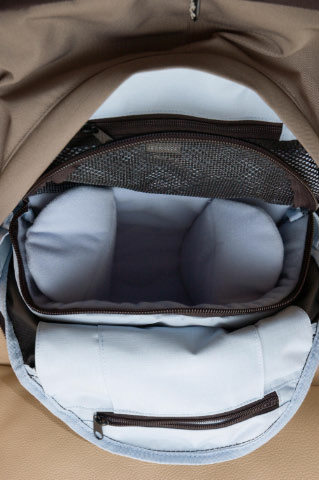 Inside the front storage compartment, there are 2 additional flat zippered pockets (one being meshed) for photographic odds and ends such as filters and spare batteries. And if that’s not enough, on the very front of the bag, there is yet another large flat pocket for goodies that can be externally accessed. 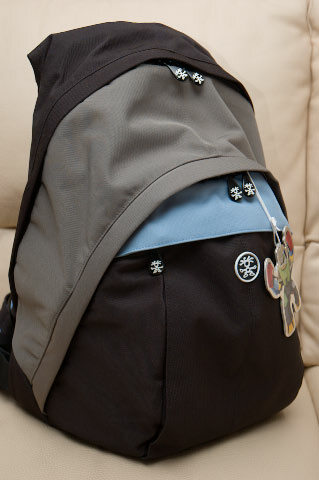 The photo bag itself is firmly attached using Velcro, so if you weren’t transporting camera equipment, you could remove it to give a fairly big storage compartment for say a bunch of textbooks or a rolled up jacket. 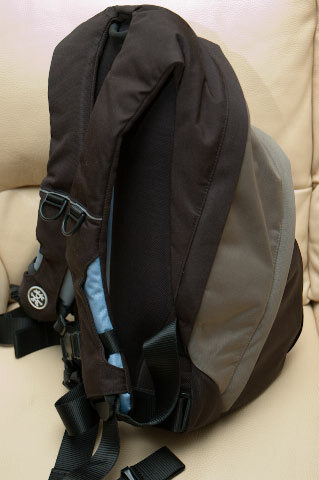 The top compartment houses the laptop sleeve and secondary storage area. The dimensions of the sleeve were mentioned previously – I would make doubly sure to measure your intended laptop to see if it will fit though. Despite the claims on the website, I had trouble fitting in my Toshiba 15.4-inch Tecra due to the width of the slot; although my 14-inch widescreen HP went in snugly, and I think 12” laptops would have no trouble at all. My wife’s 14.1-inch IBM Thinkpad was borderline – uncomfortably tight would be a suitable description. There is a large, padded Velcro-ed flap that covers the top of the laptop, to hold it in place and provide protection on all sides. The laptop sleeve doesn’t appear to be removable, though there is a document wallet on the front, which you can use carry a couple of magazines or thin books. 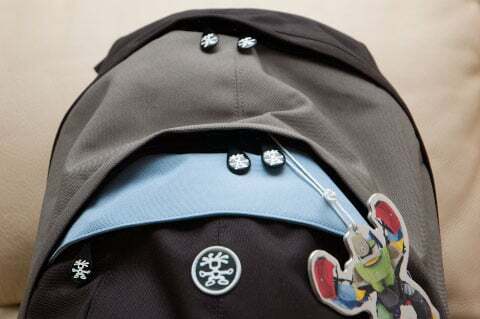 Crumpler has also generously provided a secondary storage area in front of the laptop sleeve – this area goes approximately two-thirds of the way down in depth, would comfortably fit a large lunchbox or maybe additional camera gear. In my case I used it to store camera battery chargers, the laptop power pack, cables and my Psion Series 7 PDA. At the bottom of this compartment, there appears to be some Velcro which opens up to give access to the photo compartment. However, the opening was very narrow and I didn’t bother using this facility, as the photo gear was easily accessible via the front. I suppose if the internal camera bag was removed, this portal would allow it to be used more like a traditional backpack. The only other qualm I would have about the Sinking Barge is that there is no facility attach or carry a tripod. As you’re probably gathered from my introduction – protection is paramount when it comes to my gear. With the Sinking Barge, I found that all the essentials were very well protected through the generous amount of padding available. The laptop is insulated by approximately ¼ inch thick padding on the inner side, while the back of the bag has at least ½ inch of padding at the thinnest point. With the camera compartment, the removable lining and dividers were about 1/3 inch thick and constructed of scratch free material. The only gap in protection I felt, was the top of the camera case – which only had a mesh screen covering it internally and no real padding externally. Since my camera’s LCD was sitting face up in the default configuration, so I refrained from placing anything hard in the inner pockets. If one was paranoid I suppose, a small towel could be placed on top the mesh to provide just that extra peace of mind. The exterior of the bag is made of a water resistant nylon shell which does appear to repel water droplets, although prolonged exposure to rain will definitely not have a happy ending. Backpack style bags are very comfortable for carrying over long periods, because the weight is well distributed over both shoulders. That being said, there are different grades of comfort as well as some can be very poorly designed. Compared to my laptop backpack which I use for work, I found the Crumpler Sinking Barge to be leagues ahead in the comfort department. The Sinking Barge has 2 thick raised ridges of padding that sit well on the shoulder blades. There is a groove down the middle as well which seems to provide good ventilation. 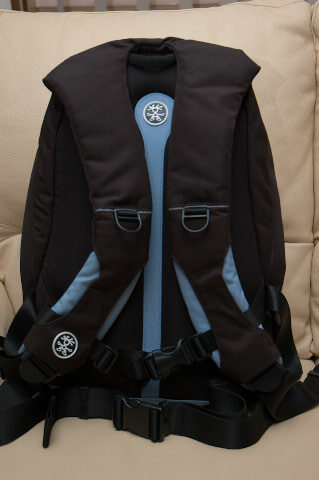 Very wide shoulder straps are provided that are approximately 1/3 inch thick, which make them very comfortable. 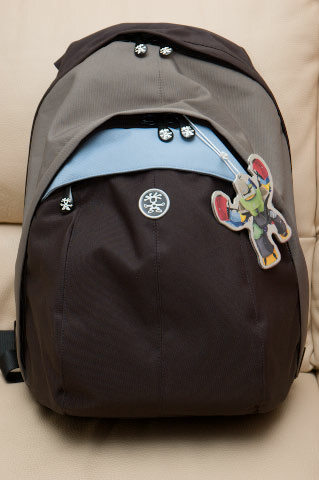 When worn, the backpack sits at the right height on your back, and the shoulder straps don’t interfere with arm mobility. 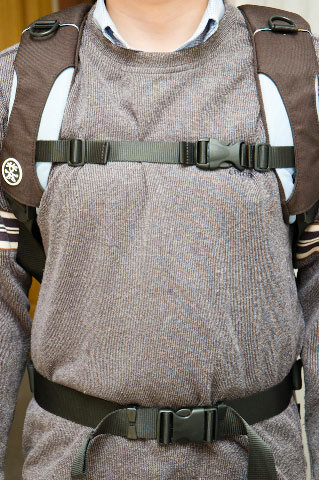 The backpack also sports a waist strap and upper chest strap for extra stability when hiking over long distances. Despite being a “smaller” model, the Sinking Barge is quite large in outward appearance. 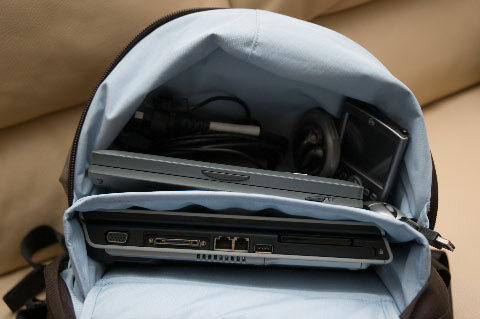 In fact, it is not dissimilar to a large schoolbag, and when devoid of contents it doesn’t compress down. In crowded areas and shopping centers you might have to be careful not to knock people or objects over when turning around, due to the large footprint. Although I haven’t tried it – the total measurement of dimensions comes up to 111cm, which would suggest that it would be suitable for carry on baggage on domestic and international flights. I strongly recommend though, due to the large appearance, that you check with your airlines to avoid any inconvenience. Do note that in spite of the physical size, the amount of internal space might be a bit less than originally assumed. It probably boils down to the amount of padding included in the bag and the materials used to give it the solid, quality feel. On the up side – it is lighter than it looks, and your equipment is more protected. At the end of the day though, it managed to carry my laptop, dual lens kit, flashgun and accessories in a fashion that was both useful and durable. One thing I like about the Sinking Barge is that your camera gear is readily accessible, even while the bag is on your shoulders. They have designed the shoulder straps to be curved in such a way that you can flick off one shoulder strap, then swing it round so you can reach the front camera compartment. As mentioned previously, the upright camera bag-like storage means you don’t have to lay the backpack flat on the ground before getting your gear out. Finally, there are a couple of plastic D loops on the front of the shoulder straps for you to hang additional bags or holders. Crumpler are well known for making stylish, durable bags that are well constructed and useful at the same time. The Sinking Barge definitely carries on this tradition and one gets the impression that the designers really put a lot of effort into the finer details. I found that my equipment was well protected, and the bag itself was very comfortable to carry. The biggest concerns I have rest mainly around the physical size vs capacity, but if you’re looking to carry a laptop and accessories in addition to a lightweight camera kit, then the Sinking Barge does it in style. The Sinking Barge from Crumpler retails for AUD$265 or US$170. More information can be found on their Australian website. They also have US based site and a rather unusual UK site. As I say to all my family, friends and readers – reviews usually comprise of one person’s opinion. Do yourself a favour by visiting your local camera shop and try the product out for yourself. If possible, bring your gear with you to make sure that everything fits. This will give you a better idea whether it is suited to your needs. Support Shuttertalk by purchasing the Crumpler Sinking Barge on Amazon with free shipping! The D50, D80 and D60 are all similar in size. It should fit, no problems. 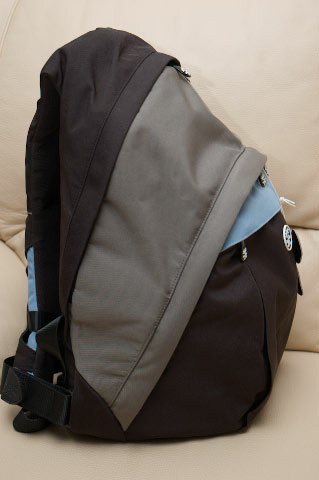 i am looking for a bag that will fit my 15″ macbook and my d80. you wouldn’t happen to have tried to fit a d80, have you? i’m not familiar with the d50, but i’m assuming it’s similar to the d60? anyway, your review has definitely helped me make a decision. I can verify that the D80 does fit. I have one as well as this bag, and it easily fits. I love my Sinking Barge, and I always bring it with me when I travel. I’ve been looking for a bag that I could take with me when I visit Spain. I’ve taken a look at several bags, but for some reason Crumpler just looks more eye appealing than the rest! My budget is unfortunately $150 so I can’t get this model… but it looks great. Like yourself I need to be able to fit at the least a DSLR with 2 lenses, a 15″ labtop and a book here and there. It’s tough to find one that will fit my minimal equipment at a reasonable price range with a decent design. I guess quality is what you paid for : ) Do you have any other suggestions for bags? I’ve been searching like a mad man…even sat for a few hours at cambags.com but their site doesn’t seem up to date, or at least I can’t find some of the bags they are mentioning. But either way, your review was perfect and you also captured all the angles I was looking for (especially the picture of what it looks like on a real person). hehe… if you’ve got suggestions that you’re willing to share.